If you’re like me, you constantly battle with your chickens as you try to get them to sleep in the coop. Mine constantly get out of the pen and sleep in the bushes next to the coop. So every night I have to go out and put them to bed. A few times I’ve heard something scurrying across the pen and then climb up a tree. The other night I was putting my chicken to bed and when I went into the pen I saw a big possum go running out of the coop and up a tree. I then put the chicken in the coop and went to get some food. For some reason, when I came back, I looked into the dark coop to find another possum curled up in the back corner. At this point I have a sleepy chicken (completely oblivious to the situation) sitting on her perch and a VERY ticked off possum hissing in the back. So I’m thinking “what’s going to be easier, reaching into my small coop and grabbing the sleepy chicken or getting a super upset possum out of my coop. I decided to get a long stick and poke the possum until it ran off. Which was MUCH easier said than done. It didn’t want to leave and kept going back and forth across the coop. I kept having to poke it away from my (still sleeping) chicken and try to heard it toward the door. 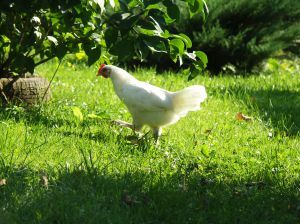 It finally ran of and then escaped out of the pen. we have had opposums in the coop, too! 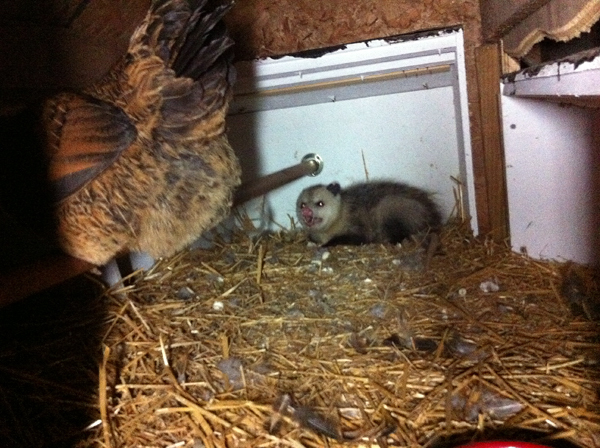 and at first the chickens were terrified of them – but the opposums don’t seem to do anything evil…. and then they stopped freakign out …. 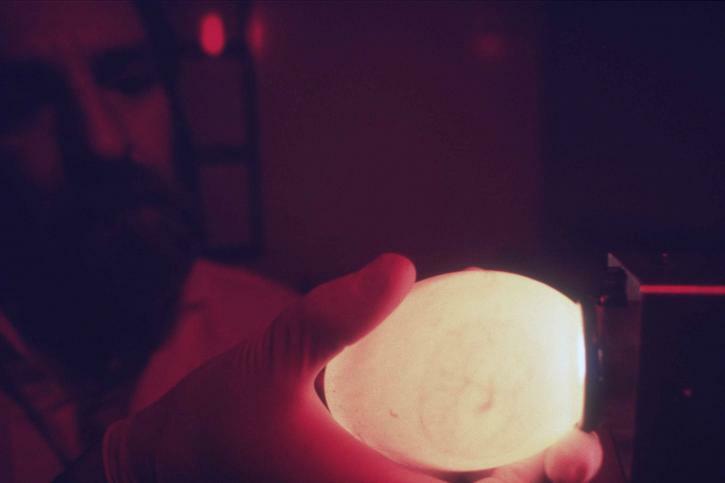 have you had any dead chickens? or ar theopposums just after eggs? They are not after the eggs. 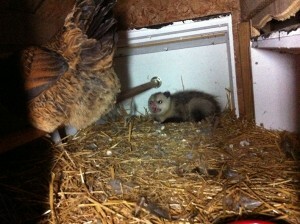 Possums will kill chickens. 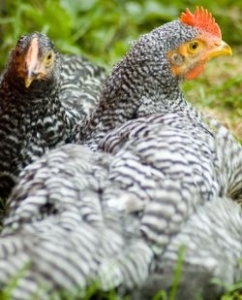 We have lost numerous chickens in the past due to possums and raccoons. Next time don’t poke it with a stick, poke it with a pitch fork! Years ago our possums died from lead poisoning. Today, the flock guardian takes care of them! Yikes! I’ll never forget the first time I saw a possum up close and personal. I was a kid and went out to feed the barn cats in the evening. It was winter and I needed a flashlight. I walked into the barn, aimed the flashlight in the direction of the cat food bowl, and saw two glowing eyes and a pink nose. AHHHH… scared me to death! We’ve never had possums in our coop. This is probably because I built the coop so tight with boards and 1/2 inch hardware cloth that nothing larger than a caterpillar can get in. Now, our house is another story. The summer before last saw me finding baby possums all over the house over the course of a week, or so. One of them tried to snuggle up to my husband in bed. Picked that one up and let it go outside. Found one swimming in our bathtub. Picked that one up and let it go outside. Found one balancing on the top of a bottle of mouthwash, in the bathroom cabinet. Picked that one up and let it go outside. The fourth one was eating the dog’s food, in the living room. I was tired of transporting baby possums, so I just left that one alone. I gather it got tired of the dog food and abandoned our house on it’s own accord. Wow, good story. That’s weird that they were all in your house. This one walked in through the coops door. That is what I keep my gun for. Out there it is usually a raccoon, but occasionally a fox or coyote. I’d take car of the possum as well. At least the air rifle to get it to leave. I got one of those solar powered night guard lights. (Amazon) It blinks intermittently and spooks intruding animals. Seems to work well; we live on a creek with lots of woodland critters and they aren’t bothering my hens. I have had marauding possums in my laundry room looking for cat food.